This mystery has some of the most inventive murders I've read - which is a sort of compliment really - honest. Set when Henry VIII is looking to make Catherine Parr his 6th wife, it tells of a country where religious turmoil has cause the country to fragment - there are all manner of religious flavours, some are flavour of the month, others are being suppressed and all this at the whim of the King. The barrister here, Matthew Shardlake, is one of those who has lost faith, but is still an eager minded lawyer. he is drawn into the affair when his friend is murdered & left to be found in the fountain in the Inns of court. The affair is hushed up by the coroner, but Shardlake soon finds that this is on orders from above - and is then involved in the intrigue of court and discovering who the deranged killer is. 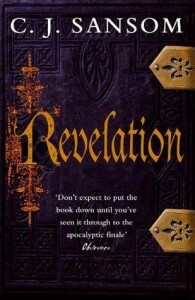 The murders follow a sequence from the book of Revelation (hence the title) and, as I said, are most inventive. It's rather convoluted, but it is more an intellectual exercise than a gory one. Shardlake is an interesting character, taking cases that merit attention, not just those that pay well. He also seems to gather waifs and strays to himself, but takes care of those he allows close. But this covers more ground than just the murders. There are intertwined stories concerning madness, religious persecution and the treatment of the poor post the dissolution of the religious houses who used to provide this safety net. The information about Bedlam and the availability of legal counsel to the poor is very interesting, as is the emergence of a more modern view of medicine, as represented in the book. It feels like a very distant past, but it is brought to life quite vividly here. It's a good enough book, and there are others in the series that would be worth a look if I came across them.